Ten years ago today, I did my first race: On Oct. 30, 2005, I walked a full marathon (26.2 miles), the Marine Corps Marathon in Washington, D.C.
My life has since changed in numerous, wonderful ways. To be honest, it changed even before that date, as I embarked on months of training for the race. Committing to such a goal and working toward it provides motivation and reward at many steps along the way. And I shared so much of that with co-workers who also were training for the event. 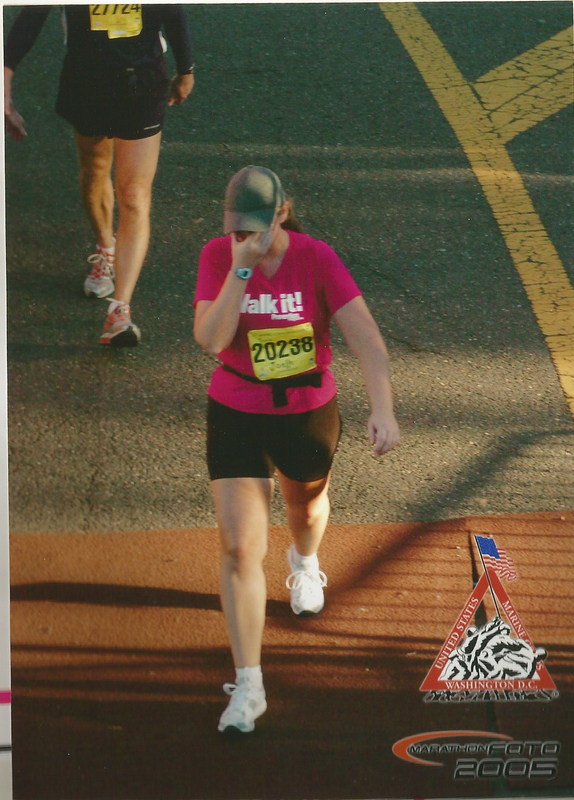 Crossing my first finish line was a very emotional experience! The goal was daunting, to be sure, but with each longer-distance training walk, I felt stronger, more prepared and more sure that I could do it. The race day itself remains one of the most emotional and fantastic days of my life, and the memory will never (I hope!) fade. The Marine Corps Marathon certainly is a great experience for a first-timer — and a walker, at that — because 1) it attracts a huge participant field and you’re never alone on the course, 2) the spectators are plentiful and nearly everywhere, 3) the scenery is pretty impressive (U.S. Capitol … Washington Monument … Smithsonian buildings), and 4) a Marine puts your medal around your neck. How great is that? Doing this race was life-changing for the obvious reasons — achieving a big fitness goal, learning about what I could accomplish physically, feeling oh-so-proud for doing it. As someone who hated gym class, was never among the first chosen for a team, and finished pretty much last in every meet when I spent one season on the high school track team (javelin, discus and shot-put), I finally found a physical outlet that felt great and at which I could feel a sense of achievement. I caught the race bug, to be sure. I did a full marathon each of the next two years and then tried my hand (foot?) at half marathons. Before each race, I still felt a few butterflies, but I also felt confident in my abilities. As each finish line came into view and I crossed it, I still felt the same sense of elation and pride. I returned to the Marine Corps Marathon in 2011 to do my fourth full marathon, and on Sunday I’ll be doing my 15th half marathon. Lots of fun times with race friends! Doing races is a great way to visit new places and really see them. There’s nothing like a race course that winds around a city to help you get an overview of somewhere new. Races have taken me to (among other places) Oregon, the Outer Banks, Myrtle Beach, new parts of Pennsylvania, Las Vegas, Florida and Dallas. In some cases, I was participating and in some cases I was there as a team coordinator, but in either case the travel was a great bonus. Becoming a marathoner has altered my career path as well. It led me to seek certification as a group fitness instructor so I could work with others who were inspired and motivated by the idea of training to walk a race. I can’t get enough of the great feelings gained from doing a race; I love to see others experience it too! But probably the best part of my race “career” is the friendships I’ve formed with fellow walkers. Preparing for and participating in a race is quite the bonding experience — and it’s so much fun to share it with good friends. So, I want to send thanks and love to Katie, MaryPat, Beth, Pat, Pam, Rebecca, Jane, George, Kim, Annie, MaryAnn, Lee, Mary, Megan, Lana, Robynn, Bim, Jes, Marianne and others with whom I’ve shared this journey. (Katie, MaryPat and Beth get top billing because they, too, were on that course 10 years ago today, even though I didn’t know MaryPat and Beth very well at that point. Pat and Pam were seemingly everywhere along the course to cheer for us, even though we barely knew each other.) I’ll always have a fond place in my heart, too, for Karen, Polly and Craig, the most organized spectator crew ever on that day in 2005. Thanks and love go, too, to the guy I call my “personal cheerleader-slash-photographer,” Chris. He’s the most patient and willing spectator I know. And special thanks and love to Michele, whose idea to create a walk-a-marathon training plan and program started it all. Look at how much pride and joy you’ve brought to so many, Michele! THANK YOU, from the bottom of my heart (and feet). This entry was posted in My story, Race stories and tagged first marathon, first race, friends, half marathons, life-changing, life-changing event, marathon, Marine Corps Marathon, race buddies, race memories, race training by Walk With Joelle. Bookmark the permalink. You are welcome! And thank you for being my right hand in helping to grow the program! Looking forward to sharing your 15th half with you this weekend! Joelle, you and Michele were the inspirations to change my life in so many ways. It is a privilege to have you as mentors and friends that gave me the courage to take that first step in my journey 7 years ago. It will be great to join you both this weekend in my 14th Half. Walk on Ladies and explore all the new possibilities! 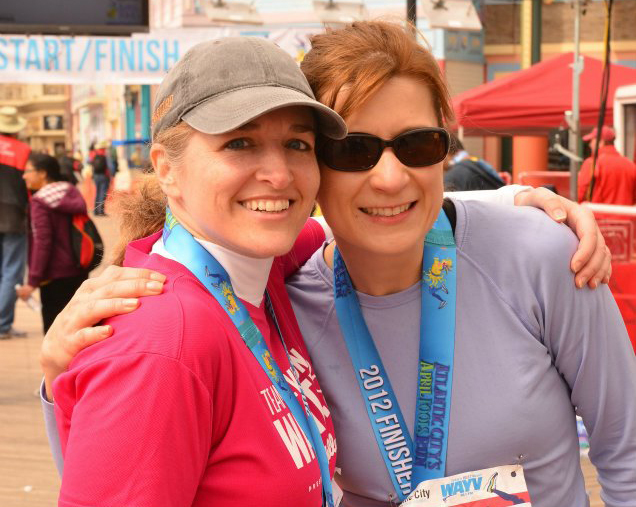 Can’t wait to share another race with you, MaryAnn! Thanks for your lovely words — but believe me, the inspiration and privilege goes both ways. Love you too, Joelle!! This came at a good time for me as I’m trying to decide which race will be my first (and only, believe that!) full marathon and maybe I’ll just have to check out the Marine Corp race!